Joyce Marie Maresh was born April 19, 1941 to Lester and Thelma (Pike) Maresh in the family home in rural Kimball, SD. She passed away in her home under hospice care, with her daughter Brenda at her side, on Jan. 14, 2017, at age 75. 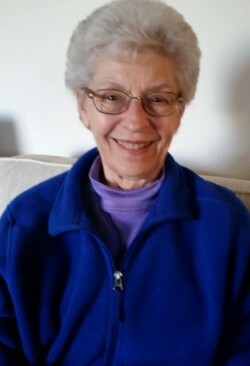 Joyce graduated from Kimball High School in 1959, attended Moody Bible Institute in Chicago for 3 years, graduated from Sioux Falls College in SD and continued her education at Seattle Pacific University and the University of WA. Joyce married Thomas (Ed) Edwards on Nov. 9, 1967 in Seattle WA and lived there in the same house for 48 years. She continued her teaching career in Tukwila for 20 years. They had two daughters, Amy and Brenda. Joyce was always active in the churches she attended, working in the nursery, as a Sunday School Teacher and also in the MOPS program with 3 year olds. She loved having family and friends in her home, got great enjoyment from baking and cooking, enjoyed helping others and doing things for them. She took great pride in her yard, flower garden & vegetable garden, sharing with her neighbors. She had a strong faith and loved sharing the love of Jesus with others. She was preceded in death by her parents, Lester and Thelma Maresh, her husband Thomas (Ed), sister Mavis Schraeder, brother-in-law Edwin Erickson, niece Rebecca Schraeder, & sister-in-law Doris Edwards. Joyce is survived by her daughters Amy Joachim (Michelle)- Lutz, FL, Brenda Bagwell (Paul)-Connell, WA; her 3 grandchildren Addie, Audrey and Andrew Bagwell of Connell, WA; sister June Erickson-Sioux Falls, SD; brother-in-law Jim (Debbie) Edwards-Kennewick, WA; plus other nieces, nephews and cousins and many special friends. I found Joyce to be a delightful friend and Sister in Christ. She extended herself to me when I retired from my teaching career and we had an easy connection as retired educators. I loved being in Bible Study with her; she truly loved Jesus and stood on the promises of God. She sacrificed to support my missionary daughter and family in the glorifying of God's Name to the farthest corners of the earth. Her steadfast faith and peace blessed me always , including just 4 days before her Homegoing. I will miss her beautiful smile and genuine heart for God. Your mom was a wonderful lady Brenda. She finally got home! I love you my dear friend. Praying that the Lord Jesus gives you the strength to finish what she started and then come home to your wonderful family! She was a wonderful Sunday school teacher for my children - I will always remember her taking time to tell me the little antics the kids would do in her class.